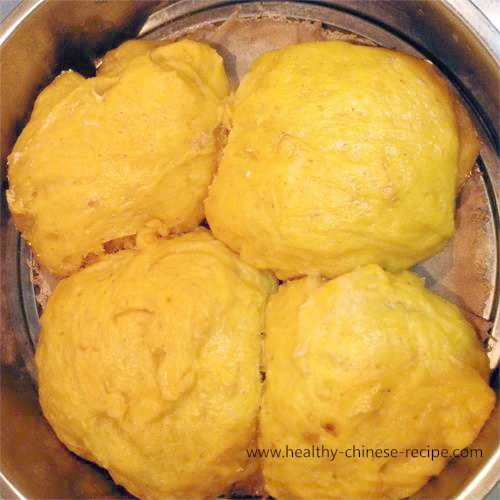 Mixed cooked pumpkin with wheat flour, add yeast, knead into dough. Fermented: seeing the fermented dough squeezes out from the lid. Steaming: from the transparent lid peep the dough growing and swelling into big cake in the steamer. 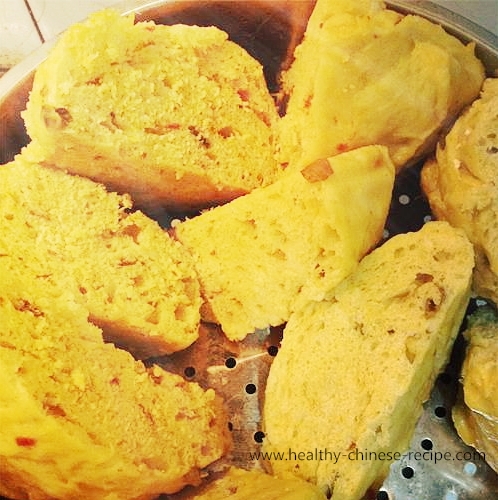 Before eating: taking away the lid, in front of you is mouth watering steamed golden cake. Eating: take a bite, so soft while a little al dente， very light fragrance of pumpkin and wheat. After eating: you have to control your appetite, otherwise you won't stop until you become too full. No oil, on sugar, no salt, only wheat flour, pumpkin, and yeast. Very healthy, suitable for diabetes (but avoid eating too much),stomach cold-pain friends. I know you can't wait to know how I made it. Ok, I'll share with you at once. Below is the recipe. 1. Wash pumpkin, seed. Cut into small blocks. 2. After the pumpkin cools down to lukewarm, mash and put it in the wheat flour. Mixed with yeast. Stir and knead into dough. Add a little water if not soft enough. 3. Cover, let it rise in a warm place. Sometimes it's hard to rise at room temperature. You can heat water in a steamer or a pot. Put the basin in it. 4. When the dough is full fermented (there are many holes ) it becomes very soft, sticky, and a little watery. Spread a piece of cloth(or gauze) on the steamer tray. Apply a little wheat flour to the dough and divide into 8-9 small dough. Put them on the steamer tray one by one. Wait 10-15mins to let the dough rise again. 5. Steam for 20-25mins. Serve. 1. You should make the dough a little softer than that when making bread. 2. If adding a little rice porridge or oatmeal the cake has better mouth feeling. 3. Serve with soups, or other vegetable dishes. 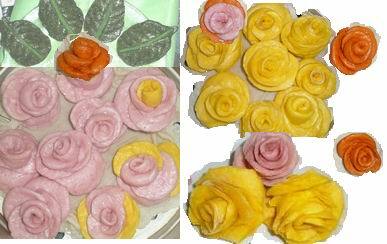 I made flower shape steamed bun before by using pumpkin. But the should be as the same hard as that when making bread. Below is the picture. Pink color is purple sweet potato. Red color is tomato.